Here come the magnetic vehicles! 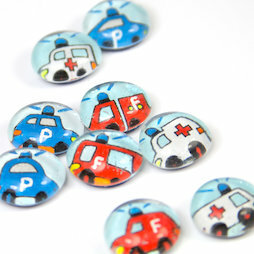 These pretty glass magnets with rescue vehicles on them are handmade in Switzerland. While the actual vehicles ensure safety on the streets, the strong neodymium magnets on the backside ensure a strong hold on the magnetic board.